Picture provided may not be actual product. Manufacturer has not provided pictures for all products. Install Time - 4 hrs. Whether you drag race, road race, set land speed records or drift, DC Sports Race headers deliver the power you need to finish first. Our Race headers deliver unrestricted power through extensive tuning and by eliminating the catalytic converter(s) for all-out performance. All of our Race headers are dyno tuned and tested against the competition to outperform all comparable systems on the market. DC Sports Race headers are available in 4-into-1 or 4-2-1 configurations depending on which design produces the most power during development. Our header systems are precision bent on our CNC mandrel benders using data acquired from our non-contact digitizing scanner. Our flanges are CNC machined, we machine-grind the flange mating surface to ensure a leak-free seal and use a robotic welder to attach the flange to the header pipes. Our state-of-the-art manufacturing process ensures superior quality and a perfect fit with every header system we make. 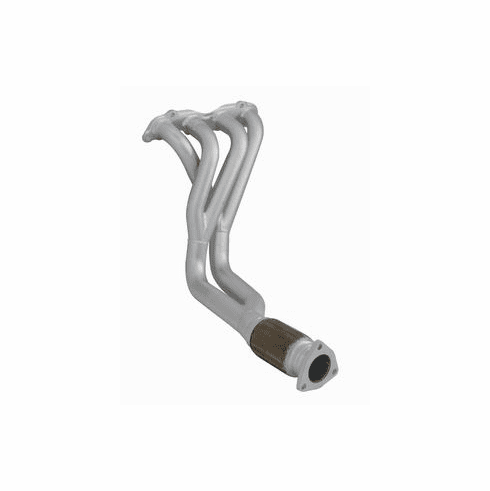 DC Sports Race headers are available in 304-stainless steel or in mild steel with a proprietary temperature- and corrosion-resistant ceramic coating. Once our mild-steel systems are completed in manufacturing, they are subjected to a thermal degrease and a preliminary sandblast to prepare the header�s surface for coating adhesion. Every ceramic-coated system is hand-painted to ensure an even application of coating. After verifying the proper thickness of the coating, the header is cured for proper bonding of the ceramic coating and then fine-blasted for a high-luster finish.